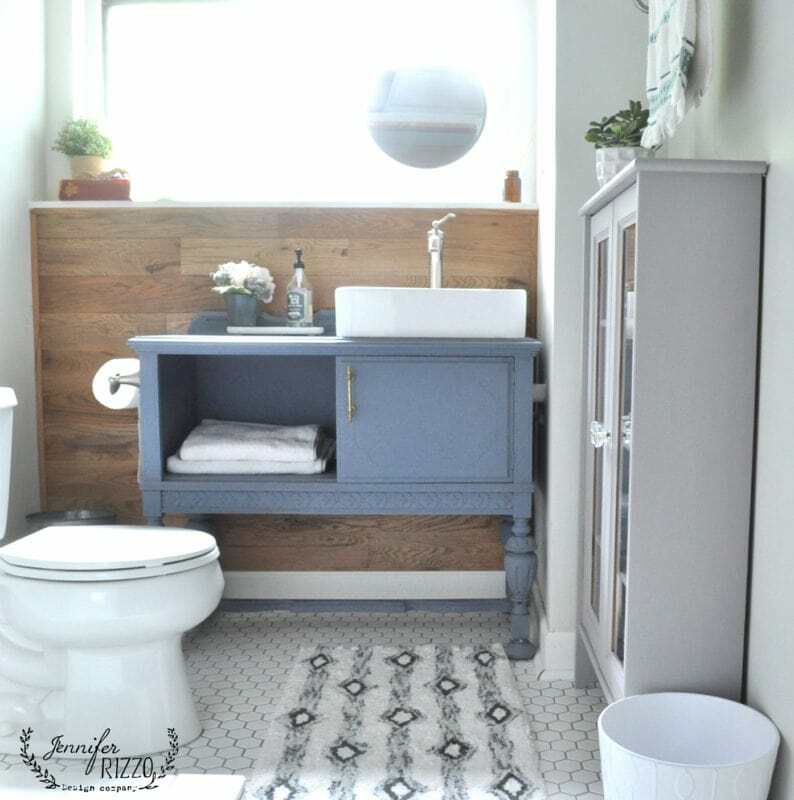 We’ve been slowly finishing the second guest bathroom renovation as we can, and I thought I would share the almost (kind of) finished project with you! We’ve going along as budget and time allow for our bathroom renovation. 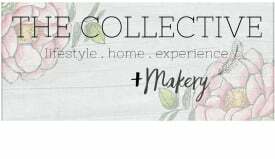 I shared our wood wall with you already , and the painted storage cabinet I recently finished. We’ve finally started putting it all together. We turned a small, vintage buffet that my sister-in-law found for $50 into our vanity. 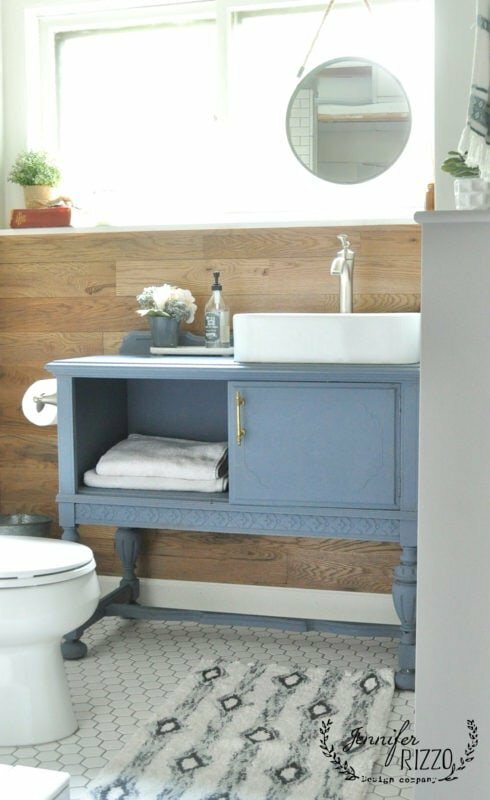 The sink was more than the vanity at $139, but it saves us almost $250! Many pre-made vanities of similar sizes were $400 plus, not including the faucet! I decided to removeone door for now and see how I liked it as open storage. We kept the door just in case I wanted to put it back. I liked the idea of towels there for now,but a few people in our home use the bathroom as a library, so I may need to put the door back on for “stuff”. You have to keep those magazines and crosswords somewhere!!! I painted it with AS chalk paint in Old Violet, and then sealed it with polyacrylic since I knew it was going to get a good amount of water splashed on it.So far, it’s help up really well and cleaned up nicely. 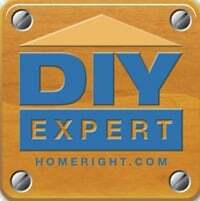 The faucet is the Wynford from Moen (sponsored), and it was perfect for the vessel sink. It was very easy to install and looks perfect with the sink! I really love how the wood accent wall looks behind everything, and really warms up the space! It’s those little touches in an update or renovation that make something look so much more personal. 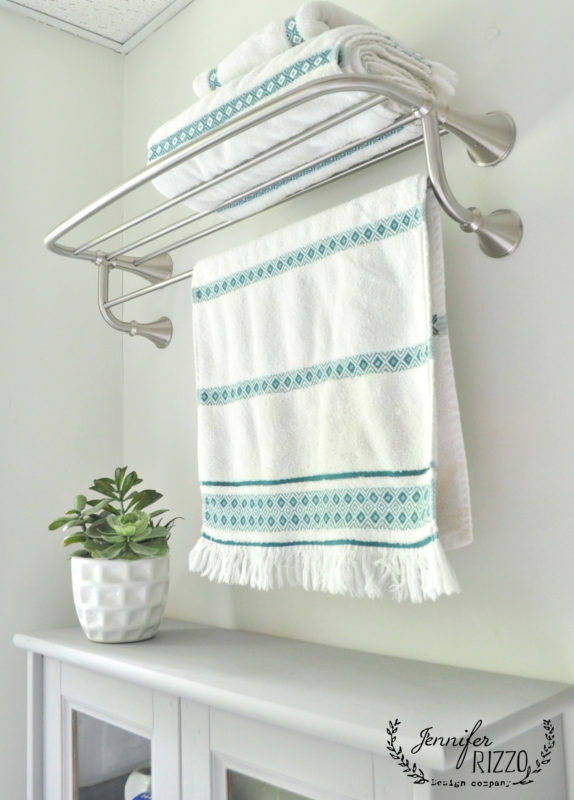 A hotel towel rack from Moen (sponsored) is an extra spot to keep towels in a small space like our guest bath. We are still trying to decided what to do about the shower. A glass surround is really expensive. 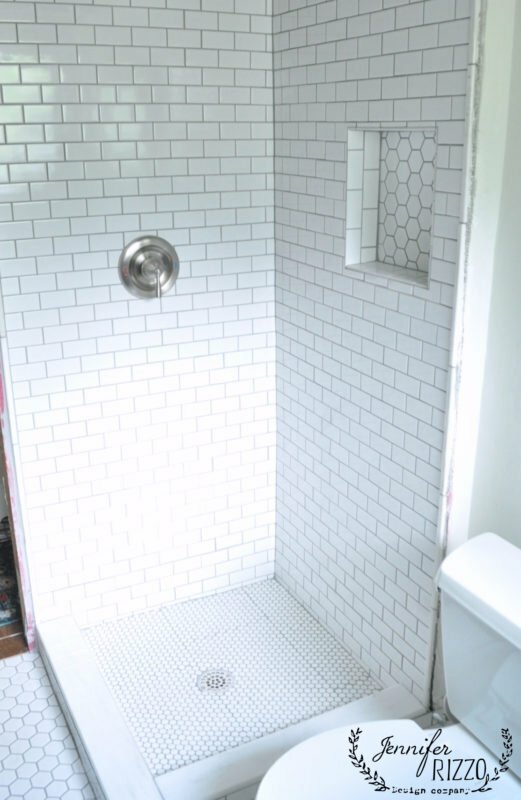 We might do either a vintage style round shower rod, or a corner shower rod. I love how the tile turned out though. 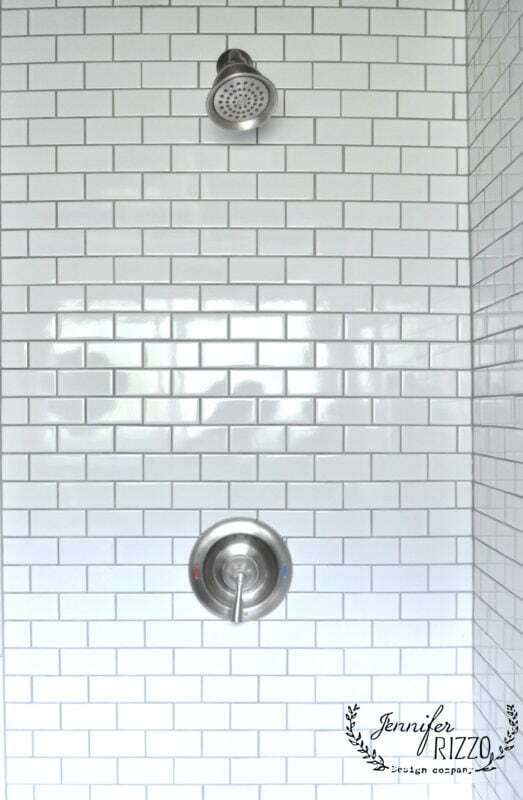 We also have a Moen (sponsored) fixtures in the shower, and I love how this one is the perfect size for our smaller shower. I am really happy with the way things are going in our guest bathroom renovation. It’s been a long haul for sure! We still need to add all of the trim along the floor and around the door and finish the ceiling. It’s nice to have it be so usable,and feel so updated! Really pretty bathroom! 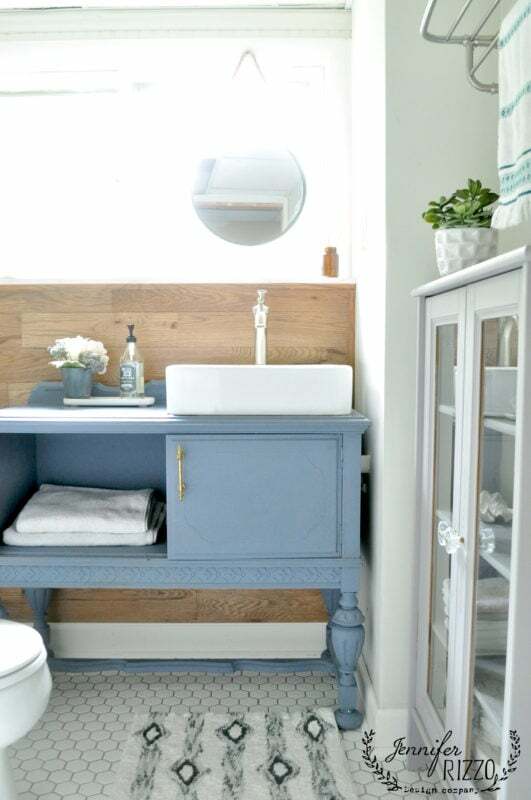 love the buffet turned vanity and the beautiful color you painted it. The tile is lovely too. 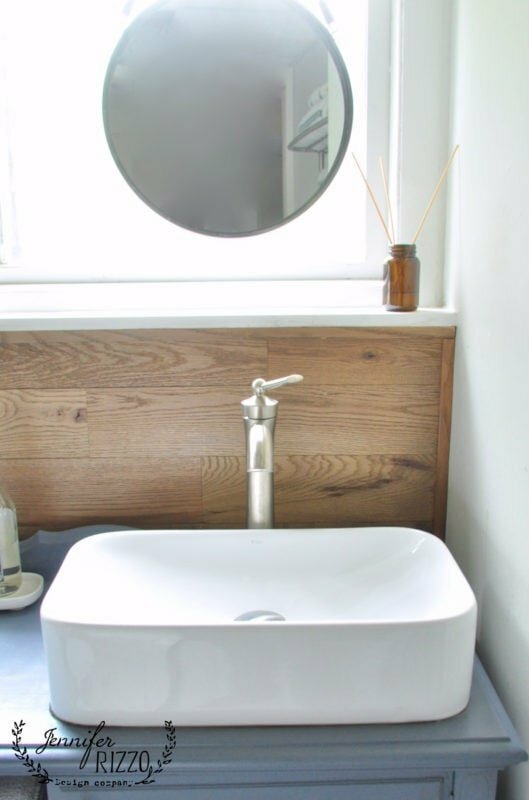 I’m a huge fan of vessel sinks. I think it looks amazing with the vanity. Thank you Karen! I love how it turned out as well!!! Thanks Shannon! It’s so nice to have it almost finished! Oh my, I love that vanity!! Gorgeous job! This is beautiful!! I especially love what you did with the sink! Perfection!